NEW WASHINGTON — The Colonel Crawford Eagles were in New Washington on Friday to meet up with Northern-10 Athletic Conference rivals, the Buckeye Central Bucks. The Eagles found themselves victorious to the tune of 34-6 over the Bucks, spoiling the cold senior night festivities. See more photos in our online gallery. The scoring started quickly for Crawford. Buckeye Central fumbled on the opening drive of the game. Kaden Schell scooped up that fumble and turned it into a touchdown. Spencer Mutchler tacked on the point after, making the score 7-0 in favor of the visitors. On the ensuing drive, the Bucks would provide an answer to the early Eagles’ score. That answer came in the form of big running from Owen Ackerman. Ackerman took the Bucks from their own 11-yard line all the way down to the Crawford 35 in just a single carry. A few plays later, it would be Ackerman that ran the ball in from 5 yards out for the lone Bucks touchdown. After the blocked PAT, the Eagles were up by a score of 7-6. Special teams played a huge part again for the Eagles, as they recovered a fumbled kickoff reception from Buckeye Central at the 24-yard line. Just moments later, Crawford scored their first of four offensive touchdowns. Trevor Shawber ran the ball in from 4 yards out, Mutchler added another extra point and the Eagles lead the Bucks, 14-6. After some back and forth play to start the second quarter, Blake Treisch found the endzone on a 1-yard run and with the point after, Crawford went up 21-6. Colonel Crawford received the ball to start the second half and put together an 89-yard drive that ended in another rushing touchdown for Shawber. The missed extra point made the score 27-6. Later in the third quarter, Shawber would add his third touchdown from 1 yard out, and the Eagles went ahead 34-6. The Eagles finished the game with 373 yards of total offense on 59 plays. Shawber carried the rushing load for the evening with 149 yards on 21 carries and three scores. 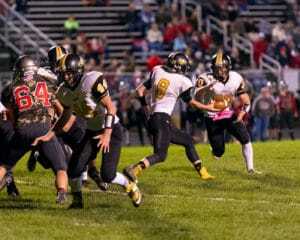 Treisch rushed the ball 13 times and picked up 111 yards and a score. Of the total yardage, 316 yards came on the ground attack. Quarterback Hayden Bute attempted just seven passes for the game and completed four for 57 yards. Kaleb Landin had two catches for 40 yards, Owin Seevers snagged one catch for 12 yards and Treisch had five yards on one catch. Defensively, Crawford allowed just 218 total yards; 146 rushing and 72 passing. With the victory, the Eagles are now 7-2 overall and 5-2 in N-10 play while the Bucks fall to 2-7 overall and 2-5 in the conference. Crawford will welcome the Upper Sandusky Rams to North Robinson on Oct.28 for the last game of the regular season. Upper is now 4-5 overall and 3-4 in the N-10 after getting blown out by the Wynford Royals, 53-0. Buckeye Central will be in Bucyrus to face those same Wynford Royals in their week 10 game on Friday. Wynford is currently sitting alone atop the N-10 Conference with a 9-0 record overall and 7-0 in league play.